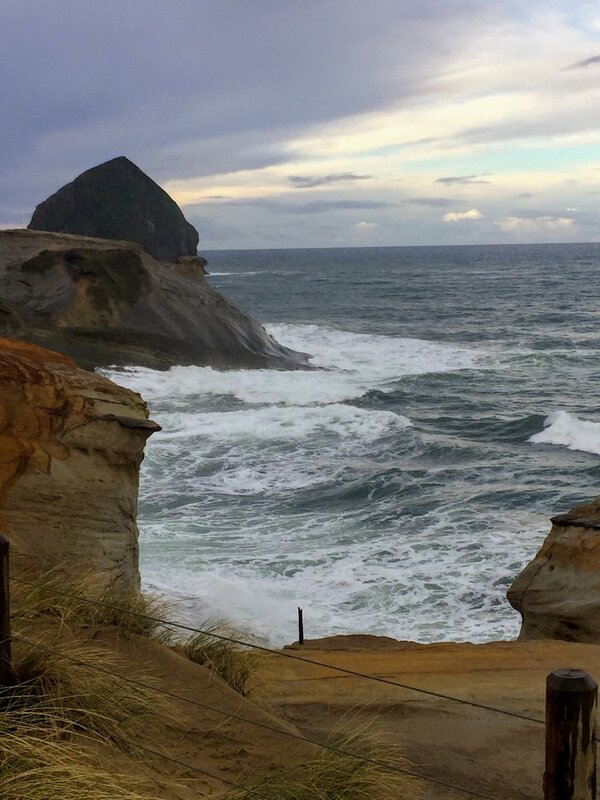 The rain stopped just as we got to Cape Kiwanda. 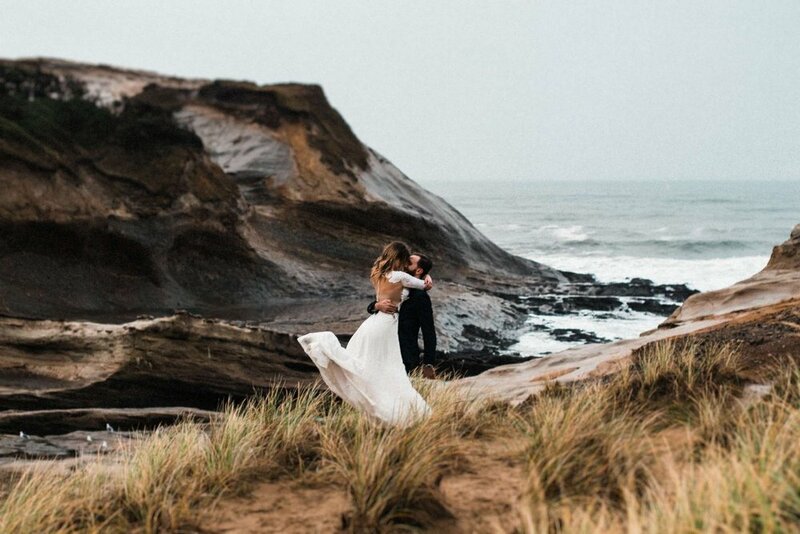 A couple weeks ago I went on a little (5hr drive) road trip down to Cape Kiwanda, Pacific City, Oregon with Erika Hernandez, the owner of The Greatest Adventure Wedding & Elopements . The weather was a typical Pacific Northwest rain. Rain that would not stop for days. As we reached our final destination in Cape Kiwanda, the clouds started to break and the sun was trying its hardest to come out. The Oregon Coast is beautiful. Cape Kiwanda has a giant sand dune that you can climb up and explore the top where you can see the big cliffs and crashing waves. This beach is also one of the only beaches that you can drive your vehicle out onto the sand! We checked into Hart's Camp, a newly opened vintage and modern airstream camp site just one block away from Cape Kiwanda. It is the ultimate luxury glamping experience! Let me tell you, this airstream campsite was the cutest campsite I had ever seen! 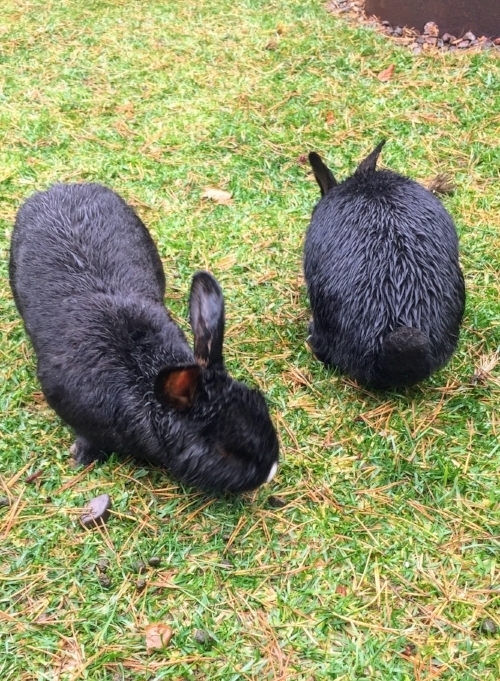 There were fat black bunnies all over the place, happily hopping around the campsites and an outdoor rainfall shower with a vertical succulent and fern garden. If it wasn’t 7˚C (45˚F) rainy and wet, I would have tried the outdoor shower. Hart's Camp airstream campsite is the cutest campsite I've ever seen. That's Erika!! As a makeup artist you never know where you will be getting ready and having the proper equipment is crucial. I never leave home without The Makeup Light and on this trip it served as my light for getting Paean ready as well as lighting up our airstream when the sun went down. Bonus!! Gabi and Brandon Fox, an awesome wife and husband photography duo, of The Foxes Photography, shot this inspired elopement. Our luck ran out as soon as we walked over to the beach. The sun slid back behind the clouds and it started raining again! Our couple, Paean and Nick, embraced the weather and had fun outside. Who doesn’t love playing outside in the rain? Ok, maybe not in a wedding dress. What IS a YUMI™ Lash Lift?!??? Summer is just around the corner (finally!) in the Pacific Northwest and that means, boating, camping, hiking and basically not wearing a ton of makeup. If you're anything like me, I only wear tinted moisturizer, blush, curl my eyelashes and apply at least two coasts of mascara.... oh, and not to forget, I HAVE to fill in my eyebrows otherwise I look like an alien! I've tried eyelash extensions and I love how they look for the first week.... then I literally start to pull them off! I know, I know, I'm not suppose to pull them off, but I get annoyed at them. I'm a stomach sleeper, eye-rubber, and I love to stick my face under the hot shower, all of which are a huge No-No when you get eyelash extensions. Not to mention, you have to get them filled every few weeks, otherwise they start to look a bit spidery. I never made it that far along because I pulled it all out of my eyes! Then I tried the YUMI™ Eyelash Lift and Tint. Oh My Goodness... it's AH-MAZING!!! I loved how it looked on my eyelashes that I thought to myself “I must learn how to do this so I can have EVERYONE feel the same way I feel about my eyelashes as I do now” I'm proud to say I'm a certified YUMI™ Eyelash Lift Technician! What IS a YUMI™ Lash Lift and Tint you ask? It's an enhancement of your natural eyelashes without the use of harsh chemicals, formaldehyde or parabens. Seriously, who wants that near your eyeballs?? The best part is that it will last 8-12 WEEKS, the natural cycle of your eyelashes. For me, I loved how I can wash and rub my eyes, sleep on my stomach and my eyelashes looked like I had curled and used mascara on them. Instant eye lift without doing anything!! I glue your eyelashes onto a silicon pad, each customized for your own eyelashes. They get sculpted and separated at the root, making sure each eyelash is straight and not clumped together. This part gets a bit science-y; a series of patent technology cream products gets applied on your eyelashes and does its magic. It targets the keratin in your eyelash hairs so it can be manipulated and stays like that. Side note- because of this process some people are calling it a Keratin Lash Lift. After I wipe off the magic cream, I use the YUMI™ brand of tints and tint your eyelashes, giving it a mascara-like look. Once I clean up your eyelashes, I give it a sweep of nourishing mascara and give you the mirror. Every single one of my clients first words are "Wow!" or "Oh my God!" and they stare in disbelief that what they are seeing are their OWN eyelashes. With those types of reactions from my clients (and myself) when first looked in the mirror, wouldn't you want to try it for yourself?? Yes, there are other eyelash lift brands out on the market but I personally chose to train with the YUMI™ brand because it is the first company to create and patent this technology in 2008. That's almost 10years ago!!!!! The YUMI™ brand is proven to last a couple weeks longer based on my instructor's first hand experience AND what other brands are advertising (4-6 weeks). It's kinda like buying a Channel purse vs a knock off on the street markets in Asia. It looks and feels the same, but eventually, it will start of fall apart. Trust me, I've bought my share of knock off purses!